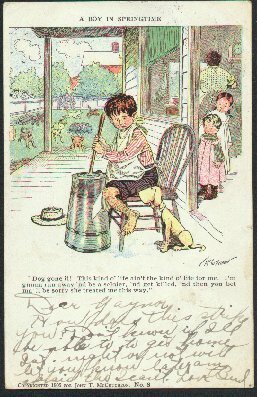 "Comic Card - McEtcheon Series - A Boy In Springtime - 1905"
(809) POSTCARD:Comic Card - John T. McCutcheon Series - A Boy In Springtime.-Condition: Very Good . 1905 - Colored Illustration. Caption under cartoon says: Dog gone it! this kind o' life ain't the kind o' life for me. I'm gonna run away and be a soldier, 'nd get killed, 'nd then you be ma'll be sorry she treated me this way. Hand written message on front reads: Dear Gaynor, How does this strike you? Don't know if I'll be able to get home Saturday night or not. I will let you know later, am afraid tho I can't. Love, Bud. Posted. Price: $8.50 + shipping.